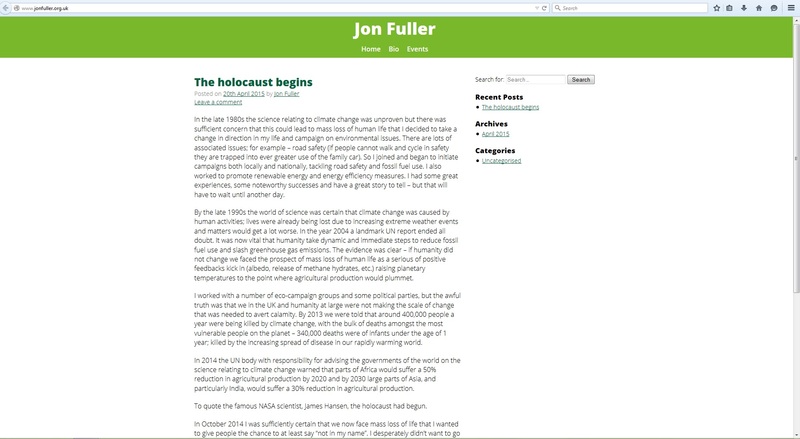 Jon Fuller advertise his website on his election literature. His sole article (so far) is an exercise in flawed thinking. The climate changes, indisputable. Some 11,000 years ago we saw the end of the most recent ice age – the world has been warming up since then. This is not a consistent warming up, the mean temperature for our planet actually fluctuates quite a bit. Some of the warmest years on record have occurred recently, and some of this will be down to the natural climate fluctuations. Some of this will, though, be a by-product of man’s activities. According to Southend West’s Green candidate, Jon Fuller, there is certainty in the science. He is sure of what he believes, and his hyperbole brooks no argument. I think he is blinkered. I am an environmentalist, and I do think we should be doing more to arrest global warming, but I think people like Jon damage our prospects. He comes across as irrational. The science is inexact and opinion varies. However, I have always argued that in of itself, despite climate change, environmentalism is good. Being respectful of the natural world and being careful with scarce resources strikes me as sensible . There are a whole host of reasons for poverty and starvation, and most of these are down to world of unfairness. We produce enough food to feed everyone, but tied to global capitalism we are unable to fairly distribute it. Whilst we throw away huge amounts of food, others starve. Using the holocaust to boost one’s arguments is revolting. Whatever Mr Fuller thinks of mass consumption, consumers are not Nazis. Neither are governments merely seeking to make their people prosper. People want choice. People want to travel. People like electronic toys, and all sorts of consumer items. People want their children to be more prosperous than them. Green Party policy attempts to shut much of this down. I think we need to strike a balance. For instance, making aircraft greener has got to be the way, not banning them. The denial of austerity (which I do not like, but I accept that we have to tackle debt) is one thing; to talk of shrinking GDP and yet promising all sorts of expenditure is primary school politics. We have to be greener, and the only way this is going to happen is with a Labour Government. Making daft and exaggerated comments only discredits arguments for greener politics. I like passion in politics, but I also like discipline when it comes to making one’s arguments. Hey, Julian, have you seen this? I reckon you need an urgent opinion readjustment. Peter Walker: I am no climate change denier – in fact I am sure you recall our conversations from near thirty years ago on this subject (and socialism too). However, I do not like lazy thinking or employing hyperbole. I also want to do something about it. Labour is a much greener option than the Tories, yet your candidate is doing his best to ensure a Tory victory. You can either choose real change, or hot air.